Still hungover from our night out in Vancouver we landed in Chicago and managed to find our hostel in Greek town, John’s face immediately lighting up at the sight of all the kebab shops around. Surprise surprise we were too early to check in so once again we dumped our bags and wondered into the city. 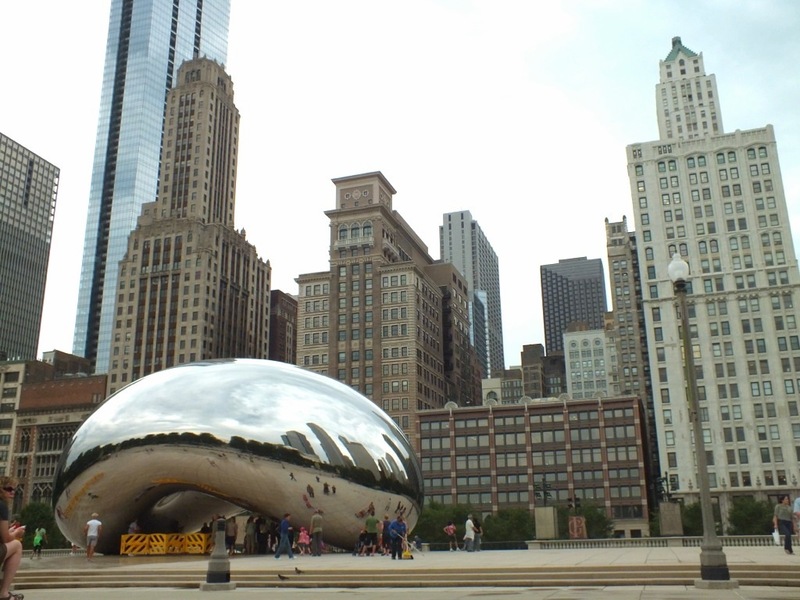 We visited one of the many parks in the city, Millennium Park. It’s a cool place to spend a hot day, there are two fountains which have faces of people from Chicago on them and when the mouths open fountains of water fall out. Children and teenagers were having a blast running in-between the fountains and getting soaked in the process! 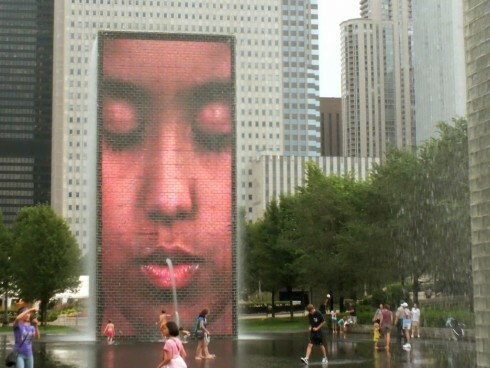 Fountains in Chicago have a face! Also in the park were various random pieces of art, you know the ones I mean every city parks got them. The centre piece of this park is a huge silver bean, we have no idea why it’s there but it looked pretty cool. The park has it’s own giant stage where choirs and bands play, mostly for free which is a nice touch. It started to rain while we were there so we ran for shelter into a tent in the park which had been set up as a free place for families to hang out, after attempting to hula and failing miserably we stopped to listen to a crazy guy sing songs with the kids which persuaded us to brave the rain and head back to our hostel for attempt two to check in. The next day the sun was out so we decided to head to the pier for the day, stopping off in the city to see a huge statue of Marilyn Monroe which was a temporary art exhibit so we were lucky to see it. 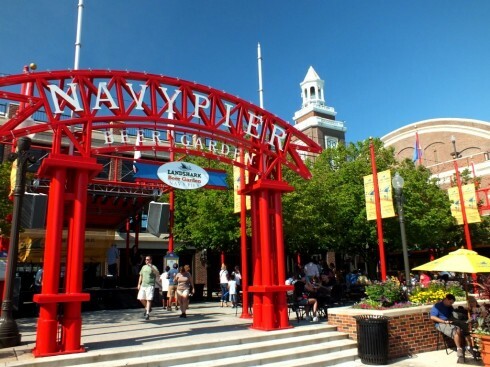 A short water taxi later we arrived at Navy Pier, where there is a ferris wheel, crazy golf, theatre… So we stopped at the beer garden to watch a live band, which was also free. That’s the best thing about this city is that there are loads of free things to see and do. Day three in Chicago was spent at the FREE zoo, which was huge and even has a Polar Bear! Needless to say I was very impressed and to top it all off lady’s were handing out free pork burgers and fans to cool us down. Extremely satisfied we walked to the beach, which was heaving with people playing volleyball and swimming but we couldn’t stay long John had a date. Johns friend from home, Nigel, has been living in Chicago for a year so we met him to watch the untied game. Lots of drinks later and after losing John on the subway we finally made it back to the hostel after a very good night and catch up. Thanks Nigel. Very rough and hungover we had to say goodbye to Chicago and catch another dreaded Greyhound bus to our next stop. We did like the city more than we had expected to though, whether this was down to the freebies and seeing old friends or Chicago itself, who knows. ← TwoFromWales.com Hit Vancouver, Canada. Country Number 13!